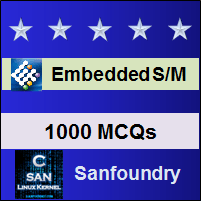 This set of Embedded Systems Multiple Choice Questions & Answers (MCQs) focuses on “Micro-controller of Embedded Systems”. 1. Which one of the following is a microcontroller from Motorola? Explanation: MC68HC05 is designed by Motorola but 4004 and 8080 are designed by Intel. MIPS is designed by MIPS technology. 2. Which is the first microcontroller? Explanation: TMS1000 is the first microcontroller which was done in April 1971 but Intel 4004 was designed in November 1971. 3. How many bits does MC68HC05 possess? Explanation: MC68HC05 is a 8 bit controller. 4. What is the bit size of the program counter in MC68HC05? Explanation: MC68HC05 have a 13-bit program counter. 5. Which of the following microcontroller is used in engine management system? Explanation: MC68HC11 was originally designed in conjunction with General Motors for use within engine management systems. As a result, its initial versions had built-in EEPROM/OTP ROM, RAM, digital I/O, timers,8 channel 8 bit A/D converter, PWM generator, and synchronous and asynchronous communications channels (RS232 and SPI). 6. Which is the concatenated register of MC68HC11? Explanation: The MC68HC11 architecture is similar to that of the 6800 and has two 8 bit accumulators referred to as registers A and B.They are concatenated to provide a 16-bit double accumulator called register D.
7. What does CCR stand for? Explanation: Condition code register is a special register in the MC68HC11. 8. How many bytes of EPROM does MC68HC7054A possess? Explanation: There are defined memory size for different processors and controllers. The MC68HC705A has 4144 bytes of EPROM. 9. Which of the following is an 8-bit command in MC68HC11? Explanation: Multiplying two 8 bit requires a 16-bit register. Explanation: MC68HC05 have different registers such as the accumulator, stack pointer, index register . Condition code register has to carry flag, zero flags, negative flag, interrupt flag, Half carry flag. 11. Which one of the following is an asynchronous communication channel? Explanation: MOO, MUDs, and VOIP are apps for the online conference which is synchronous but SPI is an asynchronous communication channel.